Transfer on Behalf of the Client. 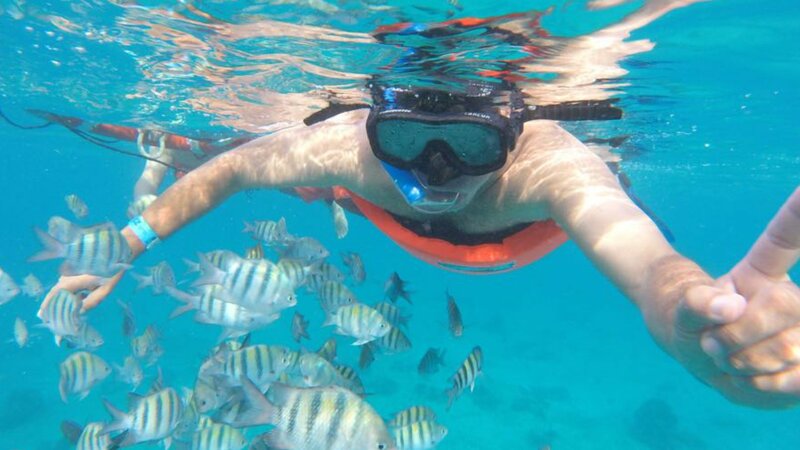 Snorkel Tour in three different reefs in Cozumel (Palancar, Colombia and El Cielo). Drinks during the Snorkel tour (Water, soda and beer). Free time at Cozumel downtown (At the end of the tour). We will visit three reefs: Palancar, Colombia and El Cielo (can vary according to the operation), immerse ourselves in the crystalline waters of Cozumel and explore the marine fauna and flora will be an unforgettable experience, our guides will always be with you , We recommend taking a water camera, these moments should be shaped to share with family and friends and why not - a photo for Facebook. Bring cash and credit card: Souvenirs and Additional Services. Recommended to take: Sunglasses, sunscreen, towel, extra clothes and water camera. Do not carry heavy loads, in Cozumel you will find everything you need. For our Clients who stay in Cozumel, will be indicated meeting point and schedule. Any person who occupies a place in the boat, even if he does not carry out the activity, must pay the marine tax. Every child who does the Snorkel regardless of age must pay the price of the Snorkel. $ 55.00 Juniors 4 - 10 Years.